After a 45 minute neutral roll out the actual stage began and Michael Rogers burned through 4007 calories during the stage. On the first climb, Rogers held 445W, or 5.75w/kg, for 11:23. Somewhat surprising is Rogers’ low cadence for the stage, he averaged only 79 RPM’s. View Pate’s full file viewer here. 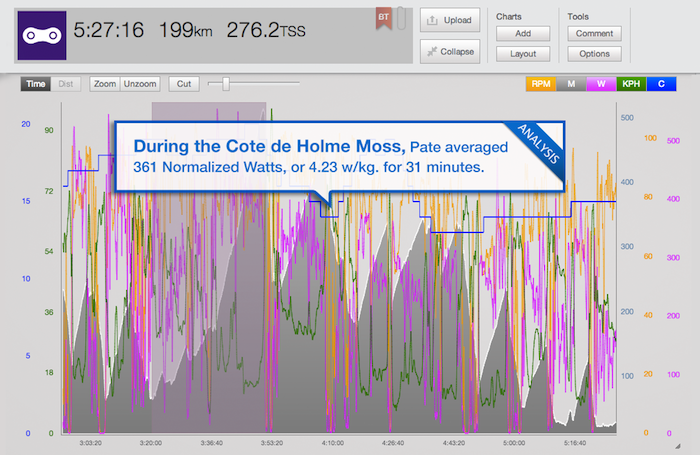 During the Cote de Holme Moss, Pate averaged 361 Normalized Watts, or 4.23 w/kg. for 31 minutes. During the five and a half hour stage, Pate burned 4267 calories. Pate hit a top speed of 100kph, or 62 mph. during one of the late descents. 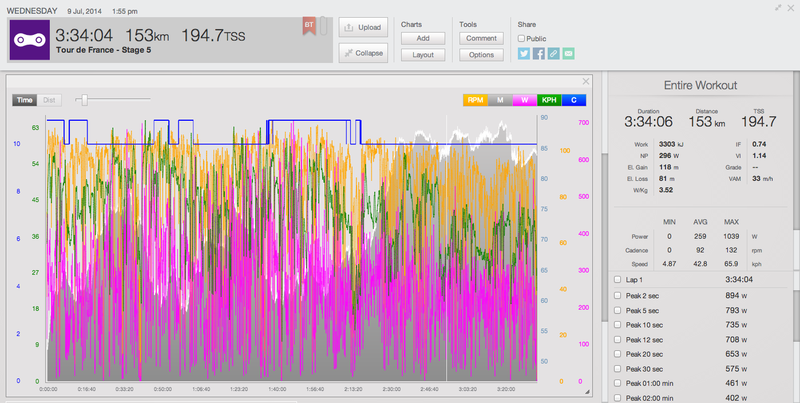 Rogers burned 4860 calories during this five and a half hour long stage. During the Cote de Holme Moss climb near the end of the stage, Rogers averaged 361 Watts, or 4.43w/kg. 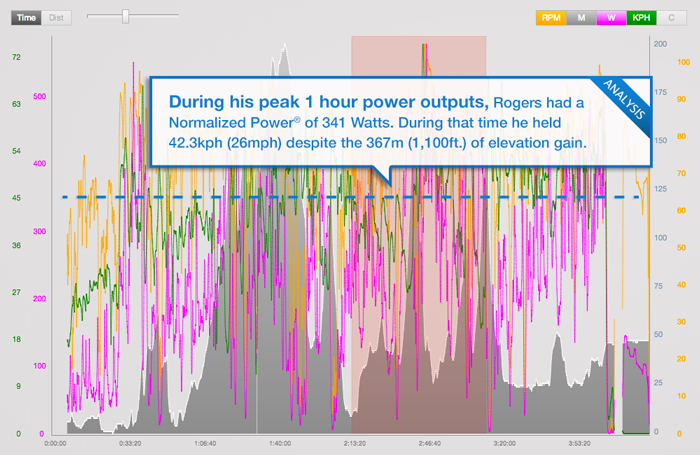 Rogers’ averaged 319 Normalized Watts for the entire stage, an average of 3.37w/kg. 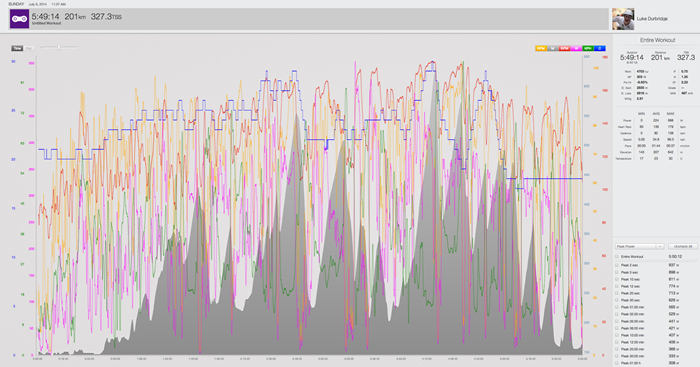 During Stage 2, Durbridge’s Normalized Power® was 303 watts for nearly six hours. The hilly terrain led to a Variability Index of 1.35. VI illustrates how steady a rider’s power output was during the race. Conserving energy is key during the early stages of the Tour and Durbridge was able to coast for nearly 25% of today’s stage. During this flat stage Rogers likely conserved as much energy as possible. His Intensity Factor® (IF®) was .64, meaning he rode at 64 percent of his Functional Threshold Power®, or what he could sustain for one hour. His Normalized Power® (NP®) was 273 watts for the stage. Rogers’ peak 1 minute power of 504W (4.39w/kg) occurred just over 10km from the finish as he was likely fighting to stay in the front group and stay safe. 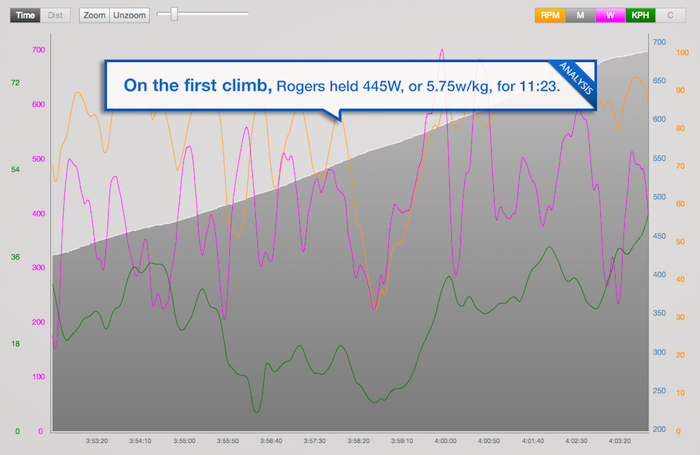 During his peak 1 hour power output, Rogers had a Normalized Power® of 341 Watts. During that time he held 42.3kph (26mph) despite the 367m (1,100ft.) of elevation gain. Another flat stage for the sprinters, Rogers was again able to conserve his energy and burned 3317 calories during the stage. Rogers’ average NP® of 300 for the entire 4:15 represents 70 percent of his Functional Threshold Power (FTP), or what he could sustain for one hour. View Hayman’s full file here. Hayman’s peak 30 minute power of 326 watts came in the final kilometers of the stage. His output was equal to 3.99w/kg and represents 88 percent of what he could hold for one hour. This shows the difficulty at the end of the flat stages. During this stage Hayman burned 3218 calories. This stage had 881m (2643ft.) of climbing yet Hayman still averaged 38.9kph (24mph). Clarke was in the break from the start. In the first 30′ his Normalized Power® was 330 watts, or 5.03w/kg. This effort had an Intensity Factor® of .968, or 97 percent of what he could hold for one hour. 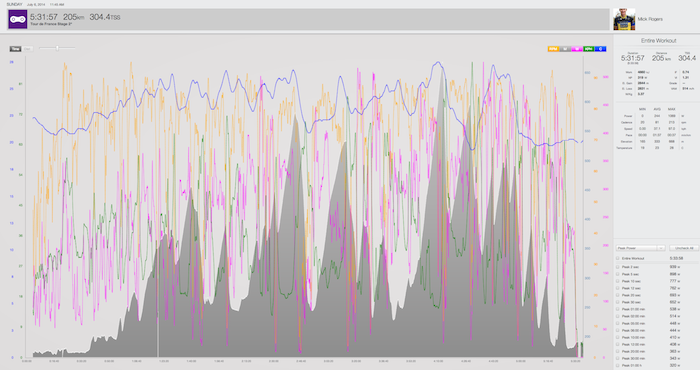 Overall, Clarke’s NP for the stage was 312 watts, or 4.78w/kg. and incredibly his IF was .92. This means that for nearly three hours, Clarke rode at 92 percent of what he could sustain for one hour. Clarke’s Variability Index® was an incredibly low 1.07. This means that rather than going hard then backing off, Clarke kept a steady effort throughout the stage. Amazingly, despite the treacherous conditions and cobblestone sections, Clarke averaged 44kph (27mph) for the 154km (95mile) stage. 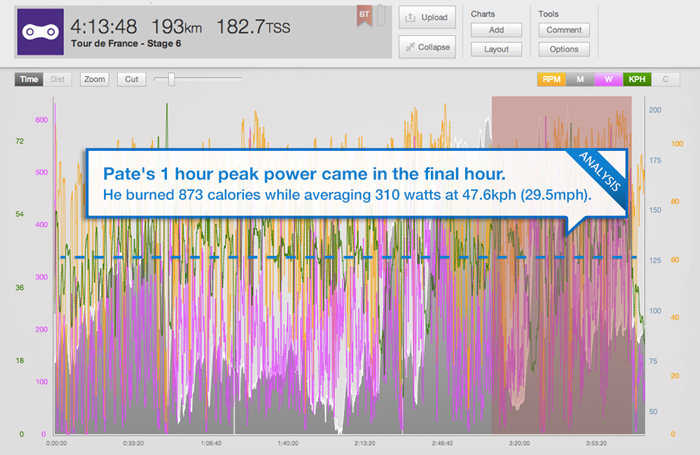 During this stage, Pate’s Normalized Power was 296 watts, or 3.52w/kg. 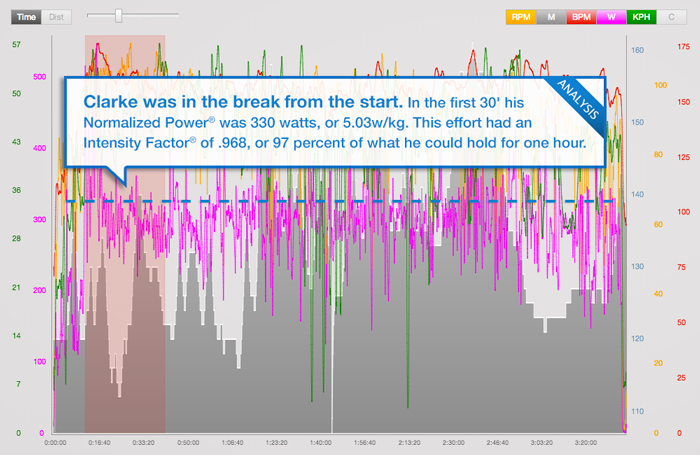 During his peak 1 hour power, Pate produced an NP of 326 watts. That effort pushed him to an average speed of 47.3kph (29mph). In just over three and a half hours Pate burned 3303 calories. Pate’s 1 hour peak power came in the final hour. He burned 873 calories while averaging 310 watts at 47.6kph (29.5mph). 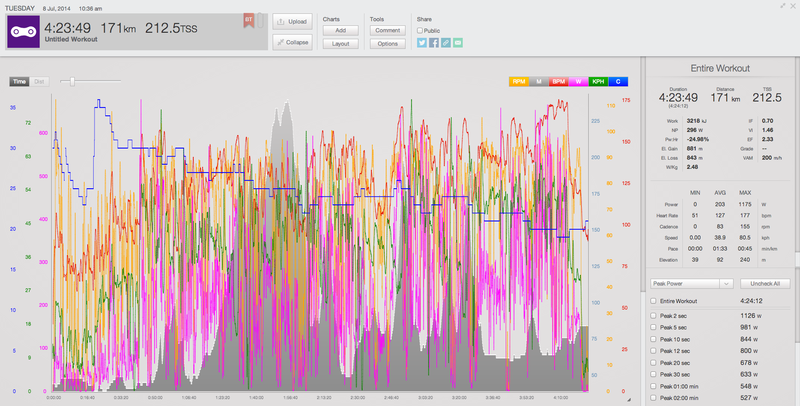 During the climb up Cote de Roucy, Pate had a Normalized Power® of 407 watts. He burned 109 calories during this 4:40 effort. Over the 193km (120miles) stage, Pate averaged 45.6kph (28mph). This is his fastest average speed of the Tour so far. Showing that this stage got harder as it went, all of Rogers’ peak power values are at the end of the stage. 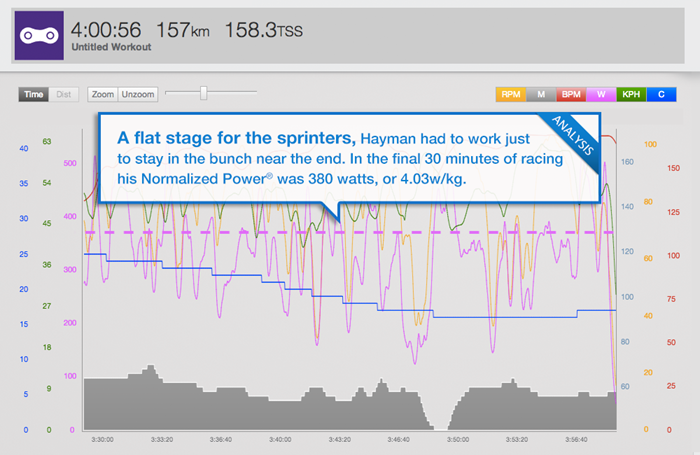 It seems that Rogers does prefer a bit of a lower cadence as he averaged 83 RPM’s during the stage. 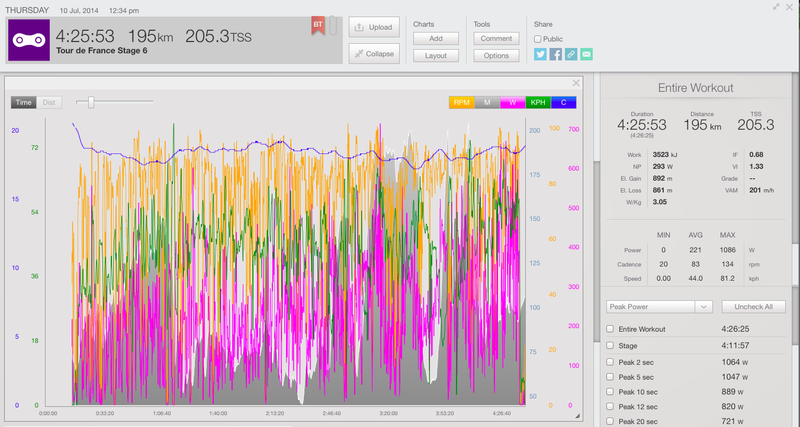 During Rogers’ peak 1 hour output he burned 1042 calories and held a Normalized Power of 348 watts. 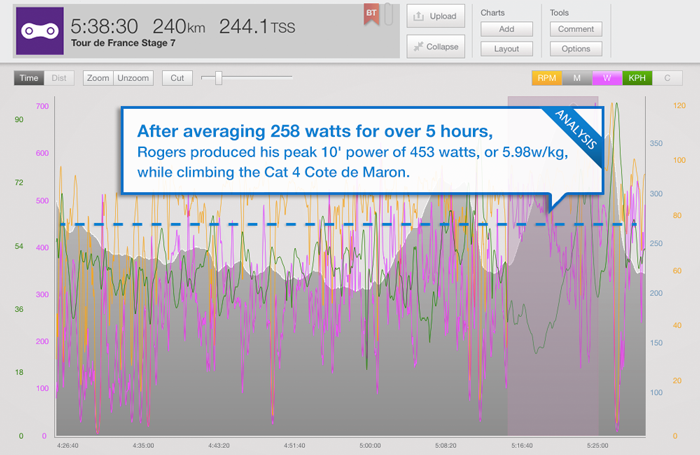 After averaging 258 watts for over 5 hours, Rogers produced his peak 10′ power of 453 watts, or 5.98w/kg, while climbing the Cat 4 Cote de Maron. With the speed of the peloton ramping up and the climbs at the end, the final hour of this stage was much harder than the beginning. Rogers’ Normalized Power® for the first half of the stage was 231 watts, that jumped up to 316 watts for the second half. This stage was the second longest of the Tour and Rogers burned 4248 calories. View power analysis from week 2 and week 3.